UF is the abbreviation for ultra-filtration membrane, which is a similar membrane to RO membranes but with bigger pores which cannot remove dissolved salts from water. The big advantage of UF water purifiers is that it will work without electricity and completely remove all microorganisms from water including the smallest of viruses. So a UF water purifier is the ideal water purifier for tap water in big cities, where you can be sure that you will always get good tap water without chemical contamination. This is because a UF water purifier is capable of removing from water even the smallest of germs, the viruses, but UF cannot take out dissolved solids from water. Works without electricity: Requires just normal pipe water pressure. Actually removes the germs from water: Even if the UV water purifier kills the germs in the water, their bodies remain in the water, whereas in UF water purifier all germs and viruses are physically removed from the water and flushed out to the drain when the UF water purifier is flush cleaned online. Can purify even cloudy turbid muddy water: UF can handle turbid or muddy water and can purify all the dirt and germs by physically removing it from the water. UV cannot purify turbid muddy water because the germs in the water will be shielded from the UV rays by the turbid dirty water particles. Better than boiled water:In boiled water the dirt, boiled germs and their eggs remain in the water, while Permionics UF Membranes filter out all dirt, germs and their eggs. No need of annual maintenance contract:A unique manual flushing system drains out all blocked germs and dirt which keeps UF Water purifiers in top condition for many years. Long lasting:With proper care UF water purifiers can work upto 10 years before major service by manufacturer is required. Fail Safe: will never give impure water, UF membranes are very tough and will not break and pass impure water. The worst that can happen is that the UF water purifier flow get reduced or blocked, but this can be cleaned to restore flow. Ultraviolet UV water purifiers cannot claim this, because with time, the UV light gets dimmer and even blocked with scale on the UV lamp, and thus becomes ineffective. There is no warning from the UV water filter purifier when this happens and you are getting unsafe water. Filters out even eggs of Germs : Removes from water the highly Chlorine resistant eggs (cysts) of Amoebic dysentery and Gastroenteritis germs - Giardiasis and Cryptosporidiosis. Some water purifiers use very strong, harmful to human consumption chlorine chemicals, to kill the germs, but their eggs (cysts) are not destroyed. The eggs (cysts) have very hard protective shells which cannot be penetrated by chlorine chemicals. Also the dead germs and their active eggs are not filtered out of the water in these purifiers. As good as RO purifier: Ultrafiltration membrane water purifiers are as good as Reverse Osmosis water purifiers when used with public or Municipal supplied pipe or tap water. Piped tap water will not have problems with dissolved salts of toxic chemicals like Arsenic or Heavy Metals. RO is only required when the water has too much dissolved salts. Works without Electricity: UF water purifiers work even during power cuts and power outages. The disadvantage of the UF water purifier is that it will not remove dissolved solids in water. Thus it is a only good for use with public supply water or well, pond, river and rain harvested waters, when you are absolutely sure that the dissolved solids (TDS) is within the limits and that it contains no toxic dissolved impurity contaminants like Arsenic, heavy metals, Nitrates, etc. If you are not sure about the dissolved solids in the water, then it is best to opt for an RO water purifier. All the leading manufacturers of water purifier filters in India like Aquaguard, Kent, Luminous, etc all have good UF water purifiers within their range of water filter purifiers. Permionics has been selling UF water purifiers in India for many years now and their Pureflow UF water prifiers are a good buy if they have a proper sales and service place near you. A Time Magazine “Invention of the Year” winner, LifeStraw is a water purifier which works exactly like a straw you use when drinking Pepsi. 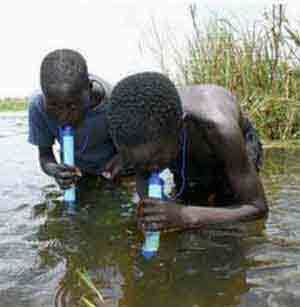 In the picture on the right you see children drinking dirty river water using LifeStraw. This point of use water purifier straw has hollow fibre membranes with 0.2 micron pore size which makes it an ultrafiltration or UF purifier, with larger than the usual UF water purifier pores. LifeStraw removes a minimum of 99.9% of all waterborne parasites and germs, including cysts of protozoan giardia and cryptosporidium. Being only of 0.2 micron pore size some small viruses may get through. This will not be the case with a point of use regular UF water purifier meant for the kitchen, where the pores are of .01 micron size and will not allow even the smallest of virus to get through to the purified water.